We read a lot of kid books at our house. I really enjoy reading to the kids. I'm pretty animated. I've even tried to use accents (when reading Charlie & Lola) but the kids protested. I usually let the kids pick out their own books, but I have veto power. No, I will not read Wall-E to you. At least not more than once a year. However, some books I enjoy just as much as the kids do. 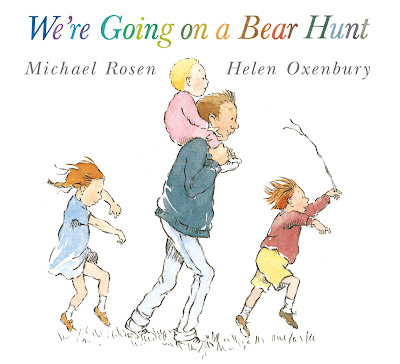 I first heard the book, "We're Going on a Bear Hunt" by Michael Rosen, at the Library during ABC club. It held my attention. The illustrations are cozy, impressionistic, and beautiful. They alternate between black and white and color. The book, like many children's books, repeats itself. The words are melodic, though, so you can almost sing through them. There's lots of fun sound non-words that make the pictures come alive some of which you just can't help but move to. Anyway, for those of you reading to kids or are a big kid themselves, check out "We're Going on a Bear Hunt".